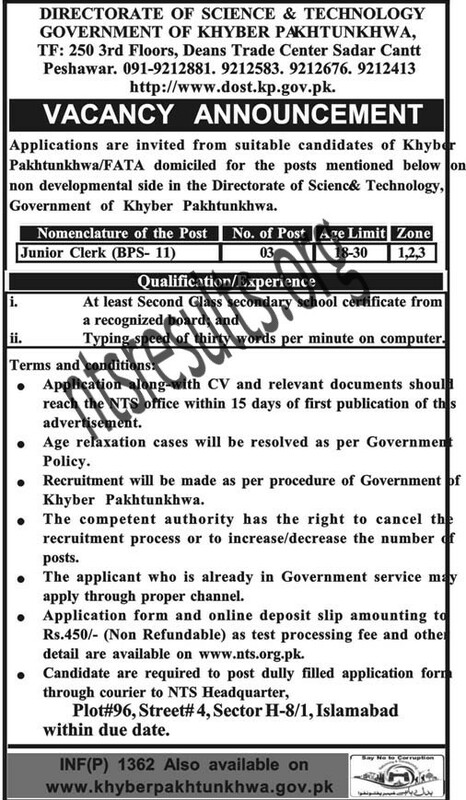 Directorate of Science And Technology NTS KPK Jobs has been announce. Download application form from here. NTS will organize the screening test. Last date to apply is Wednesday, 4th April 2018. The KPK department of Directorate of Science & Technology was created in October 2003 under the National Policy on Science and Technology. The foremost mission of DoST is to Organize Knowledge Community a step towards Knowledge Society to Support the Government of KPK in making the Shift from resource based economy to Knowledge based economy. All those candidates who have domicile of KPK and FATA are eligible to apply. 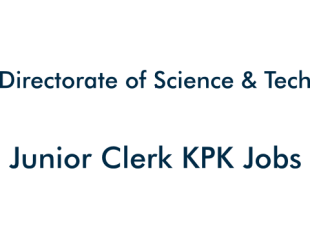 Minimum education require for the Junior Clerk Job in Directorate of Science And Technology, KPK is Second class Secondary School certificate as well as aspirant must have typing speed of 30 words per minute. Let’s move to its applying criteria which is mention below. Application along-with CV and relevant documents should reach the NTS office till Wednesday, 4th April 2018. The competent authority reserves the right to increase or decrease number of posts or cancel/postpone recruitment process at any stage. Those candidates who are already government servants apply through proper channel. Application form as well as online deposit slip amounting Rs.450/- (Non-Refundable) as test processing fees. NTS will dispatch the roll no slip to eligible candidates for test 7 to 10 days before the test date. At least Second Class secondary school certificate from a recognized board. Typing speed of thirty words per minute.